simulationHub is a new, cloud-based CFD application. Materialise released Magics20 for preparing geometry for 3D printing. CCE released free CAD viewer, EnSuite-View. FFT released Actran 16 with several new features for aeroacoustic simulations. Beta CAE launched v16.1.0 of their software suite including ANSA for preprocessing. Comet Solutions launched Cloud-based SimApps, expertly tailored simulation applications. COMSOL Multiphysics 5.2 was released with updates across its entire range of functionality. ParaView is enhancing their remote visualization capabilities through a partnership with NICE’s Desktop Cloud Visualization. Autodesk launched a beta program for cloud-based 3D design with Fusion-360 in the browser. Our next webinar on 08 December will be on the topic of overset grid generation and flow simulation using Pointwise, Suggar++, and Caelus. You can see how Pointwise interacts with OpenVSP for conceptual design in a pre-recorded webcast. Download the winning image from our desktop wallpaper contest (see image below). Come visit with us next week at the APS DFD meeting in Boston. 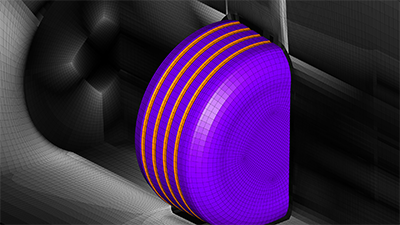 Tessa Uroić’s winning image of a mesh for a Formula 1 tire. See link above. Nor-Tech announced the availability of a demo cluster for CFD. Learn how to analyze the flow in a choke valve using midas NFX CFD. Symscape shares thoughts on tailoring geometry specifically for CFD simulation. Here’s part 3 in the series on meshing in SolidWorks Flow Simulation. CD-adapco is using Panasas’ storage technology to speed multidisciplinary simulations. 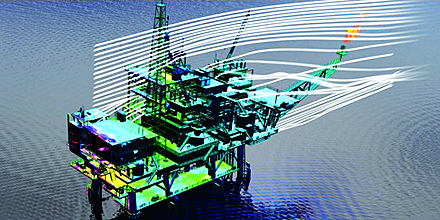 CD-adapco simulation of an offshore drilling rig. Image from Scientific Computing. See link above. Our friends at ANSYS were recognized by Software Magazine as one of the 500 largest software providers, coming in this year at #106. Registration is now open for the NAFEMS Americas Conference, 7-9 June in Seattle. Halliburton wants to hire a Mechanical Technical Advisor for CFD in Houston. What does modern dance have to do with fluid dynamics? I asked myself the same question before watching this video by Adrien M / Claire B called The Movement of Air in which three dancers interact with projections of fluids in motion and even a few grids. The Movement of Air, dance performance by Adrien M and Claire B. Screen capture from a video on vimeo. See link above. This entry was posted in Applications, Events, Hardware, News, Software and tagged Actran, ANSA, ANSYS, Autodesk, Beta CAE, CAD, Caelus, CD-adapco, Comet Solutions, COMSOL, EnSuite-View, Fusion 360, jobs, Magics, Materialise, Midas NFX, Nor-Tech, Panasas, Pointwise, simulationHub, SolidWorks, Suggar++, Symscape. Bookmark the permalink.